Army Ranger Luke Boudreau commanded a secret mission that went horribly awry. The physical wounds he takes away from the experience are inconsequential compared to his guilt for the loss of a fellow soldier – a man who will never be recognized for his bravery because of the covert nature of their operation. When Luke is recovered enough, he travels to Grover, Mississippi to pay his respects to a woman who gave her son to the service of his country. He must do so in a way that doesn’t reveal the true circumstances of the man’s death. He braces himself for a mother’s bitter anger, secretly hoping this encounter will begin to deliver him from his torment. However, what he finds in Grover is far from either recrimination or absolution. He is quickly drawn into a family that desperately needs his help – a younger brother bent on self-destruction and a mother with a secret burden of her own. And most shocking of all, he discovers a beautiful widow he didn’t know existed – a woman who tempts him to break his own moral code. I had a love affair with this book. It’s true. Don’t tell my husband. 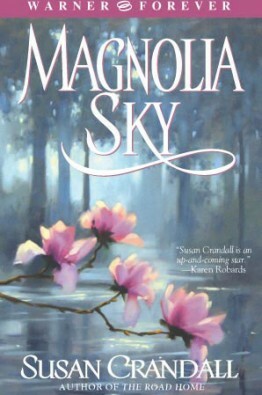 I loved everything about Magnolia Sky: the research, the setting, the characters, even working all the late nights. In a way my husband enabled this affair of mine. He, a man of straight lines and square corners, of plans and timetables, drove me around Mississippi with no more of a plan than a map in my hands and the occasional, “turn left here,” and “I want to see this county seat.” He survived – barely. And I got to know the lay of the land and meet lots of wonderful people. Did I mention that this book has a great dog in it? Rufus will forever be one of my favorite characters. Ah, yes, this was a difficult one. I still adore my original working title: MISSISSIPPI RAIN. My second choice was Magnolia Mile. Compromise is an art, they say.